As Americans we all lived through this day 11 years ago.. Some of us closer to it than others..For me, it's not that I do not care but rather the memory is still too fresh in my mind.. I lived only 20 minutes outside NYC on Sept 11, 2001.. I watched from my living room windows the planes slam into the side of those buildings exploding into a fireball and taking everyone with it in its path. I watched in horror as people jumped to their deaths from the top floors of the towers, I watched as those towers collapsed and took everyone with them. I sat trying to get through to NYC to check on friends for hours when all the phone lines were down. I watched in horror as more buildings came down.. I remember all the small children who went to school with my nephews and niece receiving the news that one or both parents had been killed and I remember watching the smoke billowing into the air for weeks afterward and the smell of death, twisted metal and burning wires that left a stench in the air so strong for weeks the windows couldn't be left open....So today, please do not think me cold hearted because I am not but I can't go back there again and again.. It's still too fresh.. 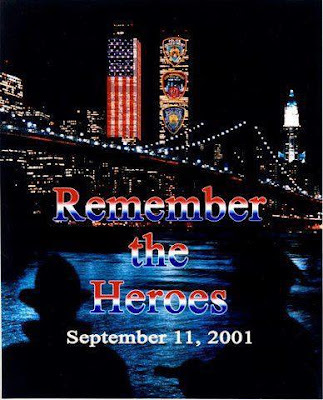 The sights, the sounds the smells...So I will simply post a remembrance and leave it there..
We live about an hour from the city and I will never forget that morning 11 years ago. Just a few minutes ago I was outside noticing how similar today is weatherwise...it's a beautiful crisp sunny day. So much has happenened in those 11 years but it also feels like it was just yesterday. Robyn, I wonder if the hurt will ever subside. It tore such a chunk out of everyone, almost as if they stole the innocence of a Country. My heart goes out to those affected personally by this tragedy, and it always will.